I've got 2 4gb ram sticks I want to put in a SL510 with a P9700. I can run either in either slot by itself and it will pass all day. If I put both in it fails test 6. 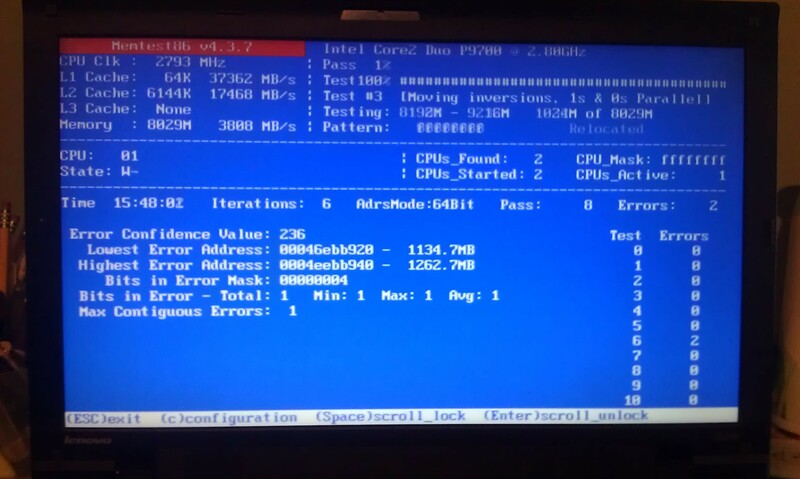 This doesn't happen with 2 2gb modules, and it also doesn't occur in another laptop (Samsung R580). The error is repeatable, and causes random BSOD's in Windows. Also are the boards similar enough to flash it with a T500 bios? Admin warning: picture WAY too big! Tags removed. Funny the laptop doesn't like the two 4GBs together so there's something wrong with the laptops hardware or BIOS. Not sure if any SL510 has been tried with 8GB. Does 6GB work? You might have to stay at that. My sister's SL510 is running with 8GB for years now. I guess, it's some timing issue. Are those RAM modules a matched kit? Edit: Or could it be a single rank / dual rank problem? I don't know whether a single 4GB single rank module would work, but at least for 2x4GB, the SL510 needs dual rank memory, AFAIK. Nonsense, it wouldn't start if this was the issue. Yes, they are Mushkin Blackline PC3L-12800 9-9-9-28. I've used them for years in my Probook with no issues. At 50hrs it now has 2 errors in test 9. You have this problem right there. 1.35V DDR3L and more likely 8 chips per module, not compatible. This C2D notebook is much older and requires 1.5V 2Rx8 (16 chips per module). I have one of T410 working great with pair of 4GB 2Rx8 1.5V using Elpida PC3-12800 running as PC3-8300 (DDR3-1066). Still a not correct one. Needs 16 chips per *module* for older computers C2D/C2Q, 1st gen i core and 2nd gen i core and up 3rd gen to Ivy Bridge. What you need to find is this: On ebay: 1.5V DDR3 2Rx8, Hynix, Elpida, Micron/Crucial, FYI by then, any third party makers and Corsair, Mushkin are all out of DDR3 16 chips modules anymore just remaining DDR3L and mostly 8 chip modules (aka 1Rx8). There are number of USA sellers on ebay and you can use your credit card order via guest mode payment. Some are used, but other sellers do sell new ones too. I have done this many times before. This exact Elpida like this works great in my T410 (same issue as C2D like your SL510). I have been buying like these example that meets criteria of 2Rx8, DDR3 (1.5V only) for my older notebooks and they works flawlessly. I once had to exchange 8 chips for 16 chips modules at local store based on third party brand under Corsair 4 years ago for 2x 8GB for sandy bridge notebook, still had to be 16 chip modules. I see what you mean now about the modules. The blacklines have the correct number of chips then, just wrong voltage. Good, correct on wrong voltage support. Try get one from suggested brand names as I shown you via ebay. Also one more thing about business computers tend to bypass the timing as found in SPD data if using third party memory modules with "performance" timings. Any of these suggested from ebay will work properly first try due to standardized timing that business computer tend to use. Samsung R580 is also from 1st gen era of processors based on i core with 3 digits type like i5-560m for example and still requires 1.5V, 2Rx8 (16 chips per module) and they only run any speeds of memory modules at DDR3-1066 like C2D with DDR3 would do at DDR3-1066 as well. If that works, I still do not suggest trusting that memory you have right now. Is the memory functioning correctly when booted into windows or are you dealing with an unstable system? Reason im asking is maybe you can leave it alone if it doesn't effect functionality. One of my T60 s suddenly went dead, while plugged into the power supply.